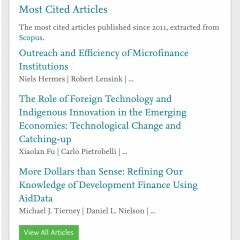 World Development - a top journal on International Development Studies - has revealed its most cited articles, and TMCD is delighted that our director - Professor Xiaolan Fu co-authored one such article. Entitled "The Role of Foreign Technology and Indigenous Innovation in the Emerging Economies: Technological Change and Catching-up", the article involved distinguished researchers, Carlo Pietrobelli (University of Rome) and Luc Soete (UNU-MERIT) as co-authors. Article abstract: This article explores in depth the role of indigenous and foreign innovation efforts in technological change and catching up in emerging economies. It also looks at the interaction between indigenous and foreign innovation. The article presents original evidence and argues that, despite the potential offered by globalisation and a liberal trade regime, the benefits of international technology diffusion can only be delivered with parallel indigenous innovation efforts and the presence of modern institutional and governance structures and conducive innovation systems. 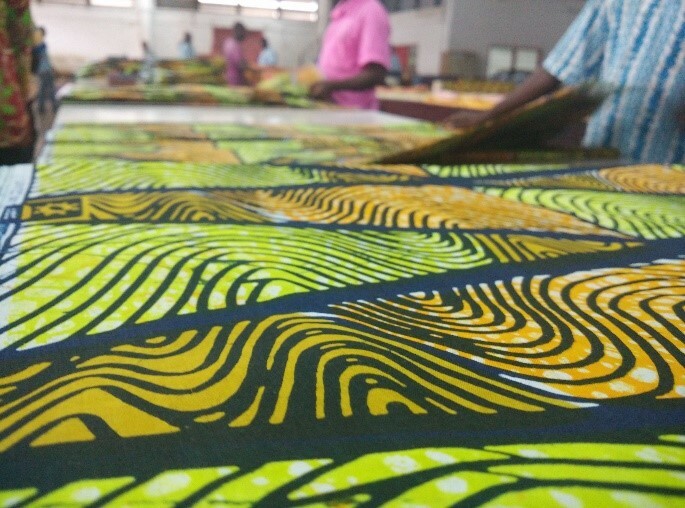 This conclusion is compounded by the expected inappropriateness of Northern technology for countries in the developing South, which calls for greater efforts to develop indigenous innovation. In this sense, indigenous and foreign innovation efforts are complementary. The TMCD MNEmerge project is a three-year international research project funded by the European Union under the Seventh Framework Programme. The TMCD research team lead by Professor Xiaolan Fu delivered has several reports. The final report is on the case study in Ghana conducted in collaboration between researchers at Oxford University and Science &Technology Policy Research Institute, Ghana. This study includes a large-scale individual-level survey of managers and workers at eight broadly comparable European and Chinese MNEs across four industries in Ghana. Both European and Chinese MNES transfer managerial knowledge to their local employees and managers. 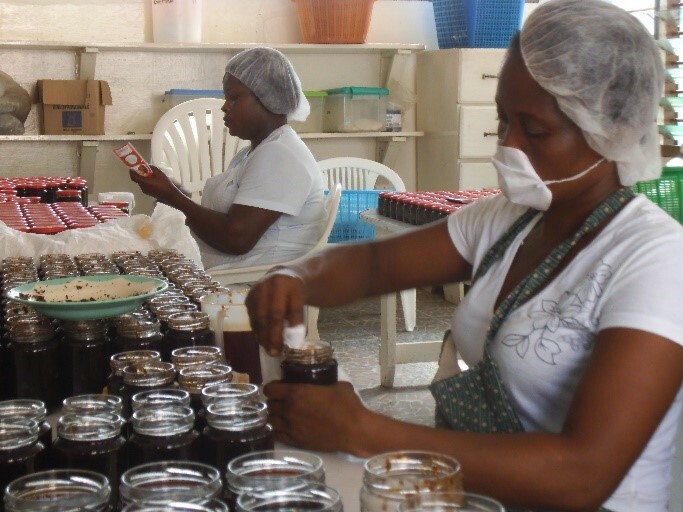 The advanced management practices adopted in the MNEs increased the levels of aspiration of the local workers for future development. Amongst both workers and managers, we found that learning potential was higher in the western MNEs than in Chinese MNEs. Cultural and language barriers are brought forward to contextualise such evidence. The report highlights the role of cultural embeddedness, which should be investigated at length when evaluating the knowledge diffusion potential of MNEs. With regard to the diffusion of managerial knowledge between organisations, this research has shown that for both European and Chinese MNEs, much is still left to be achieved in terms of local outsourcing, partnership creation, and collaboration. The extent of local-foreign exchange between MNEs and local firms was found to be limited, with variations between sectors and firms .Such results highlight the crucial role of national policy in reaping the numerous potential benefits of foreign direct investment. Encouraging MNEs to contribute to socio-economic development. TMCD warmly invites you to the first ever Sino-UK Innovation, Development and Policy Forum. The forum will take place from 1.30 – 6 PM, in the Nissan Lecture Theatre, at St Antony’s College, Oxford OX2 6JF. The forum will feature numerous high-level speakers to discuss opportunities, challenges and strategies for future Sino-UK. The event will be chaired by Professor Xiaolan Fu. All are welcome. If you wish to attend, please register here. In 2012, UN Secretary-General Ban Ki-moon launched the UN Sustainable Development Solutions Network (SDSN) to mobilize global scientific and technological expertise to promote practical problem solving for sustainable development, including the design and implementation of the Sustainable Development Goals (SDGs). Following their adoption, SDSN is committed to supporting the implementation of the SDGs at local, national, and global scales. As part of the leadership council, Prof Fu will help to oversee the work of the Sustainable Development Solutions Network. 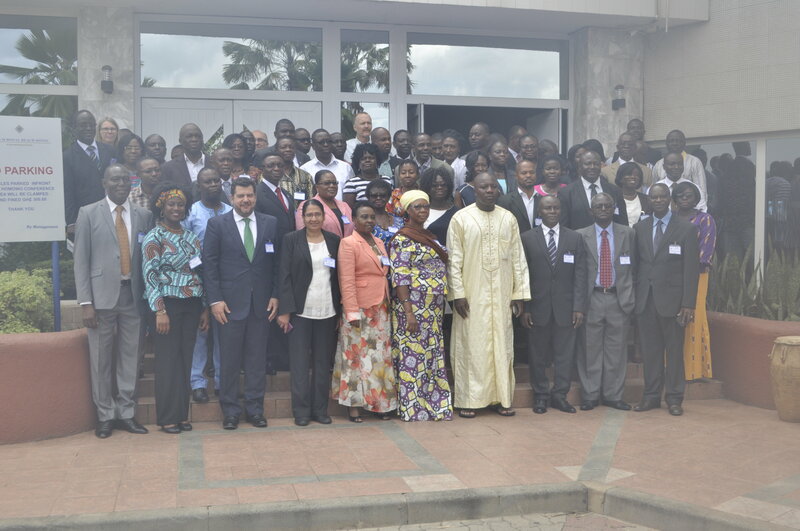 The network comprises eminent experts on sustainable development from academia, business, civil society, and the public sector. On 4 October, 2016, TMCD hosted a high-level seminar featuring the world's largest telecommunications equipment manufacturer, Huawei Technologies. The speakers were Mr. Jack Lyu, the Vice President of Huawei’s Human Resource Management Department and the Executive Secretary of Huawei’s Human Resources Committee; Mr. Tian Tao, an advisor of the Huawei International Advisory Council and Co-Director of the Ruihua Innovative Management Research Institute at Zhejiang University; and Professor Xiaobo Wu, Dean of School of Management, Director of National Institute for Innovation Management, and Director of Global Zhejiang Entrepreneur Research Center at Zhejiang University. The event was chaired by TMCD’s Professor Xiaolan Fu. Professor Xiaolan Fu gave a speech at the UNCTAD 14th Ministerial Conference held in Nairobi, Kenya, in July 2016. Speaking on the panel: “Making Innovation a Driver for Sustainable Development”, Professor Fu discussed the importance of policy coordination between innovation policies and trade and investment policies. She also stressed the important role the United Nations can play, in fostering inclusive and sustainable change and innovation through policies, and in facilitating technology transfer through partnerships and application of modern information technology. Professor Xiaolan Fu was also featured as a keynote speaker at the 2016 China Innovation Circles and Academy - Learning, Innovation and Competence Systems (CICALICS) Workshop. The initiative of CICALICS was built several years ago upon academic experience in Europe and North America. This year's event was hosted by the Sino-Danish Center. 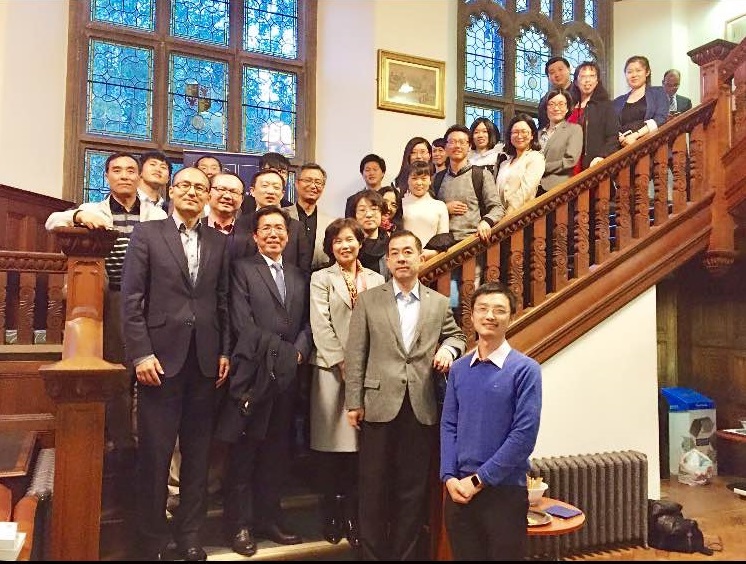 The 2016 CICALICS Workshop aimed to link scholars and research groups on learning, innovation and competence building for development in China with international research communities. CICALICS provides a platform to discuss the challenges and opportunities of the industrial transition process facing Chinese companies and China at large. These challenges and opportunities include the dynamics achieved through global engagement and collaboration with MNEs and internationalization of R&D, including acquisition of R&D facilities abroad. Professor Xiaolan Fu will also be attending the forthcoming 14th Globelics Conference in Bandung, as well as the 3rd Annual World Open Innovation Conference in Barcelona. In addition, Dr Shaheen Akter presented the MNEmerge project at the 2016 Innovation Conference-Ghana, held in Accra. TMCD was pleased to welcome delegations from the Chinese Academy of Science and Technology for Development and the Chinese Academy of Governance in June. The Chinese Academy of Science and Technology and TMCD members discussed the importance of science and technology in China’s policy framework, and the Chinese Academy of Governance discussed the importance of open innovation. We look forward to further collaboration in the future. TMCD bids farewell to Yawen Li, a Ph.D student in School of Economics and Management, Tsinghua University, Beijing, China. She is working on her doctoral dissertation with the working title: 'Building Trust in Inter-organizational Product Development Teams: Antecedents and Consequences'. 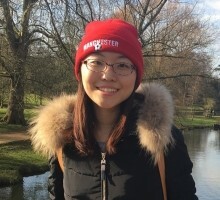 Her research interest focuses on the international collaboration in science, collaborative innovation and scientific productivity, Chinese returnees and their social network. We are grateful to have had Yawen as a part of the centre, and wish her good luck for her future endeavours! TMCD is thrilled to welcome a new visiting scholar, Ms. Jianjian Zheng. Before arriving at Oxford, She has worked in the Ministry of Science and Technology, People’s Republic of China. She holds the position of deputy director, and facilitates the reform of science and technology programs funded by the central finance department of the Chinese government. These include the development of a national science and technology management platform, the design of inter-agency conference systems, the establishment of strategic consultancy and comprehensive review committee, etc. She also oversees the management process and system research of national key R&D programs, drafts transitional period management methods of national key R&D programs, and lays down the five-year plan of major science and technology projects. TMCD is pleased to welcome on board two new project coordinators, Ola Akintola and June Sun. 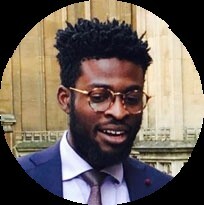 Ola is a DPhil Candidate at the Department of International Development. Before arriving at Oxford, he completed an MA in International Political Economy (with Distinction) at the University of Warwick. He also holds an MSc and a BEng in Engineering. He the Junior Dean at Jesus College. He has worked as Research Assistant at the Said Business School, Oxford Department of International Development and the Blavatnik School of Government. He has experience researching a range of issues including: Conflicts and Peacebuilding, Amnesty and DDR, Labour Standards in Global and Domestic Supply Chains, Banking Regulation in LICs. He has also worked at Stakeholder Democracy Network, Controls Risks, Aequistas Consulting and HLD Partners. June has recently finished her MPhil at the Department of International Development, where her research focused on technology transfer from Huawei and ZTE in the South African telecommunications sector. She holds a BA in Politics and International Studies from the University of Cambridge. 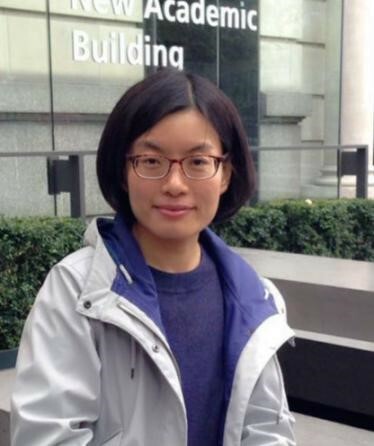 Prior to coming to Oxford, she worked as a journalist at Reuters and the South China Morning Post, and as a civil servant in the UK government. Dr. Shaheen Akter presented her and Professor Xiaolan Fu’s paper, ”The impact of multinationals on skills and aspirations: A comparative analysis of the subsidiaries in Ghana”, at the Innovation Conference Ghana (ICGhana 2016) on 27 September 2016. George Essegbey and Shaheen Akter will be presenting at the DEGRP AERC conference being held on 28th and 29th of October in Nairobi. There are two planned meetings in Brussels to review the MNEmerge project. There will also be two events taking place in Vienna in November and December. TMCD is excited to be taking part in the upcoming 100 PhD Entrepreneur Innovation Forum, which will take place in Beijing and Guangzhou in December 2016. Organised by the Western Returned Scholars Association/Chinese Overseas-Educated Scholars Association and the Association of Thousand Talents Program, the project aims to broaden the spirit of entrepreneurship and to maximise the potential of talents around the world. TMCD will be participating in the selection process for candidates from leading universities.